Users (abusers?) can upload their GPS files and then tweak them, for example to increase the climbing speed by n% and then download the doped file in order to upload to Strava. Like real doping it only takes a few people to corrupt the system and make the results meaningless. WADA won’t be clamping down but it does make you wonder whether file alteration can be detected by the likes of Strava. Seeing his season’s work come undone in Italy is hard to take for anyone and presumably he’s having some time away from it all, swapping Tenerife training for domestic duties. Still it’s strange he’s not appeared in the media and there’s no news on Sky’s star rider and his knee. But he hasn’t vanished, his celebrity status means he gets pestered for photos even when apparently shopping for household appliances. News today that both Ryder Hesjedal and André Greipel have re-signed for two more years with their respective teams and earlier this week Vincenzo Nibali apparently signed a four year renewal with Astana. Riders aren’t supposed to sign for a new team until 1 August but existing contracts can be renewed at any time. Nibali, Hesjedal and Greipel are cornerstone riders for their teams as the roster will be built in part around them. Signing them now means a significant part of the wage budget is allocated and the rest can fit in around this. With some riders in place teams can look at recruiting others. Several teams are already looking over their shoulders worried about relegation from the World Tour. Remember there are 19 teams but it will revert to 18 next year. But Vacansoleil-DCM could drop down with reduced sponsorship which solves the problem. 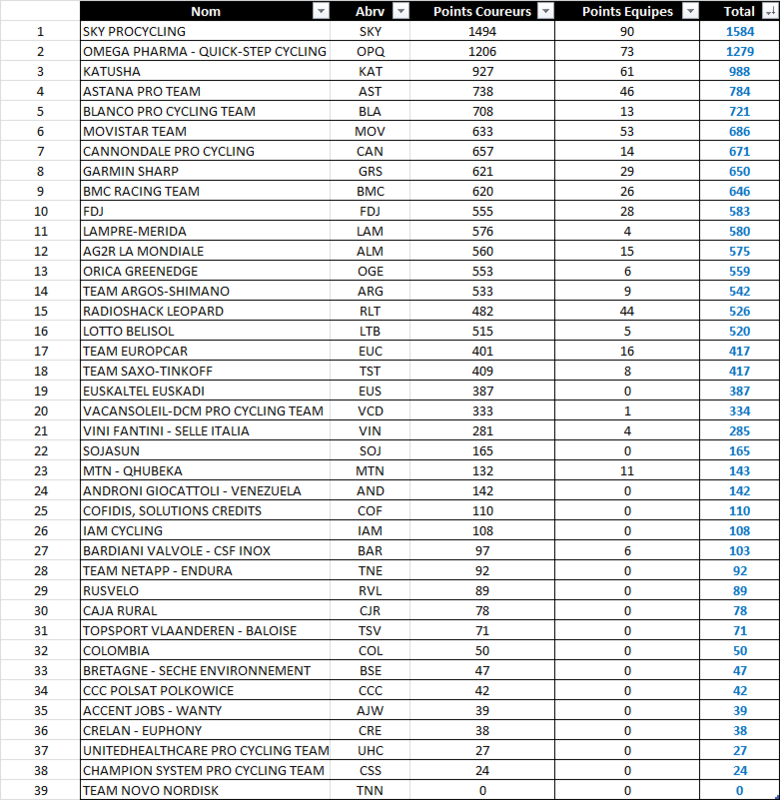 According to an informal ranking table compiled by Twitter’s Nicosix_PCP Europcar were sitting above Team Saxo-Tinkoff, Vacansoleil-DCM and Euskatel-Euskadi after the Giro and they could be taking yet more points in the Dauphiné. And teams like Radioshack-Leopard might become Trek for 2014 but the squad will need to do more than retain Fabian Cancellara in order to feel secure with their points haul. 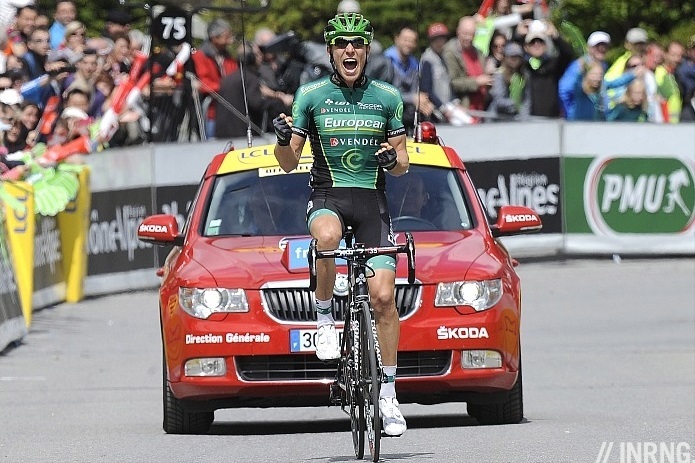 For all their success this week Europcar have a big worry as they’re sans sponsor for 2014. When BBox pulled out the team was saved by Europcar, not at the eleventh hour but the midnight bells had starting ringing. Voeckler had signed a contract with Cofidis but hadn’t faxed it back when he got news the team could be saved if he stayed put. Now everyone wants things to be sorted by the end of the Tour de France. It’s possible co-sponsor Accor, a hotel group, steps up and they’d have every reason given the publicity return. Another tale of good and bad. Good news for Corsican tourism as hotels and campsites are reporting they’re full. In recent years this hasn’t been the case but the arrival of the Tour de France seems to have brought extra customers to the French island. But “French island” is a label that can upset some. There is an independence movement and it has its extremes. The FLNC is talking of ending its ceasefire and should this happen then the Tour would be a prime symbol for them to attack. That’s speculation but the island remains Europe’s capital of crime with 11 gangster-style executions so far this year. Think of crime in Europe and you might think of Sicilian mobsters or Bulgarian heavies but the French island is apparently rated as Europe’s crime hotspot although I’d like to see how it compares to other places, for example the US. No crime has been committed yet as we’ve only got the A-sample test but Vacansoleil-DCM’s Nikita Novikov has been provisionally suspended after traces of “Hydroxy-ostarine / O Dephenyl-ostarine” were found in an out of competition test. It’s a muscle boosting product that has yet to gain regulatory approval, the idea is it could help chemo patients avoid muscle loss. A search reveals bodybuilding forums rate it although there’s a Darwin Award element as members who destroy internal organs or contract serious illness from their self-experimentation are unlikely to return and boast… although according to the Velocast’s latest episode one user tried ostarine and reported losing the sight in one eye. Novikov might be a familiar to readers as he was one of the riders to watch for 2012 after crushing his rivals in the U-23 ranks and even showing strongly against the pros. It was strange for him to avoid a pro contract with the Katusha team who had him in their Itera-Katusha development squad but he’d got an Italian agent (Alex Carera, whose clients include Nibali and many more) who recommended a change or perhaps was just able to get a higher price? Regardless his promise looks set to be extinguished and his rivals from two years ago wonder if they were robbed then too. EPO might feel like an old drug but there are new tests for it. There’s a new toxicological method, in other words a lab test, but there’s also a new WADA protocol for the statistical analysis too. This is probably the reason why the likes of Danilo Di Luca and Mauro Santambrogio have been caught but note for all the fuss regarding these two riders we’ve get to get the result of their B-sample analysis. Positive or negative, the delay is notable. I’m making a nit-picking aside but as i understand it, EPO is not technically a drug. It’s a naturally occurring bodily substance. Ethropoetin Stimulating Agents (ESAs) are the class of biological agent ( call them drugs if you like) which can be used as their name suggests. They are, admittedly, a synthetic form of EPO. I’m not a biochemist or doctor so I can’t add more details but I’m pretty sure it’s a distinction nevertheless. When a rider gets busted, they are busted for having traces of an ESA in their blood ( among other things perhaps), not the existence of EPO per se as this would already be in their body. You’re correct I think – not technically a drug – but EPO is an ESA, so it is erythropoesis stimulating, i.e. it stimulates the process of making more red blood cells. EPO is our natural source of ESA, so everyone will have some in thier blood. However, exogenous EPO differs very slightly from the bodies own EPO, so it can be detected. This isn’t all that easy, which is why the test wasn’t available until a number of years after it was first used. IIRC, the ESA mfrs have added markers to the products which enables them to be detected more easily in the users blood. Might have even been in consultation with WADA. I could be wrong but I think that occurred some time back. Well, I was thinking the same thing you mentioned, can this doping be detected. So I did a test and juiced a ride (+50%, no less) and uploaded it to Strava. Sure enough, I got all the KOMs, some flack from friends and foes and the ride was eventually flagged. Pretty sure Strava is into it. Anyway, it’s only racing when you have a number on your back – the rest is just talk (now digital Strava talk) & doesn’t mean much. Easy, man, no need to get disfunctional. It’s only a game (and only an experiment within this game), it’s not sacred “racing.” Not that there is anything sacred in racing, as it can be seen over and over. I’m happy/pleased you treat it as a game, as some others take it far too seriously – unfortunately sometimes enough to cheat. I meant that talking/boasting doesn’t mean much, not that only racing mattered! Anyway I’m off for a MTB ride for the fun, sans electronics. I did think about it but it seems to have been doing the rounds elsewhere for some time. Determined “cheats” will have found it already or in time. Which is rather the point of the piece, talk of syringes and hormones might seem foreign to many but imagine their jobs are at stake? Those who crack and start using a website to doctor their ride data just to claim the lead in an online database might well turn to real performance enhancing substances if they were faced with the choice… and those who reject it suffer the polluting effects of the cheats. I agree. It would be shooting the messenger. I was just joking about this mysterious “spirit of sport” concept, from the amused point of view of a non-Strava user. I guess your report is the microdosing variant of digital-EPO! I’d be surprised if Accor took over the Europcar title position. Their sponsorships tend to be VIK based which works well from a cost saving position as a team/event but they will only lay out serious cash if there’s a huge brand upside. Not sure what the price is but given some of the properties in European sport which can be picked up on the cheap the team will have to make a pretty compelling case. The problem for Europcar is that they are French, both in their roster and apparently in their team culture. Their big star is very popular there, but the guy you love to hate in other countries and Pierre Rolland is good enough for local here status, but (still?) just lacks quality of an international superstar. So either the new sponsor has to be a French company again – which makes the search much harder because of the state of the economy in Europe, it’s no coincidence Blanco ended up with a US sponsor – or they have to radically change the team. I agree although note the team’s made some small international concessions with Arashiro for publicity in Japan, Thurau for Germany, they’ve hired Pelucchi from Italy for Colnago and the Canadian Veilleux. But it’s all a bit low key and the team remains very French. I am not sure but suspect that Europcar as sponsors are Europcar France, Much as the older Ford sponsorship which was Ford France. If that is the case, it would explain the French nature and ethos of the team, as well as the low budget. Possibly Europcar International makes some small contribution towards the sponsorship cost. Strava – WHO CARES1 get a race number on and get your ar*e kicked for real, don’t bring your golf handicaps into this wonderful world of cycling. Go out for a ride without technology, go where the mood takes you and don’t be afraid that you didn’t pre- warn NASA of your whereabouts in case you get a puncture or god forbid take a wrong turn and actually get a little lost. Just make sure you have plugged your bike in to charge your pointlessly overrated electronic transmissions. The only way to go out for a ride without technology is to run barefoot. Reading Strava EPO’s site disclaimer, the irony spills over. If anyone reading this still goes on and use it then he/she has to check their iq and do something about it. Being cheats is a less serious offence in this case, it has less priority in their list of problems to solve.